Mummy Thomas’ Mental Health Questionnaire with Susannah. Susannah Pitman was born and raised in northern New Jersey. She received her bachelors degree from Syracuse University and her masters degree from Tri-State College of Acupuncture. 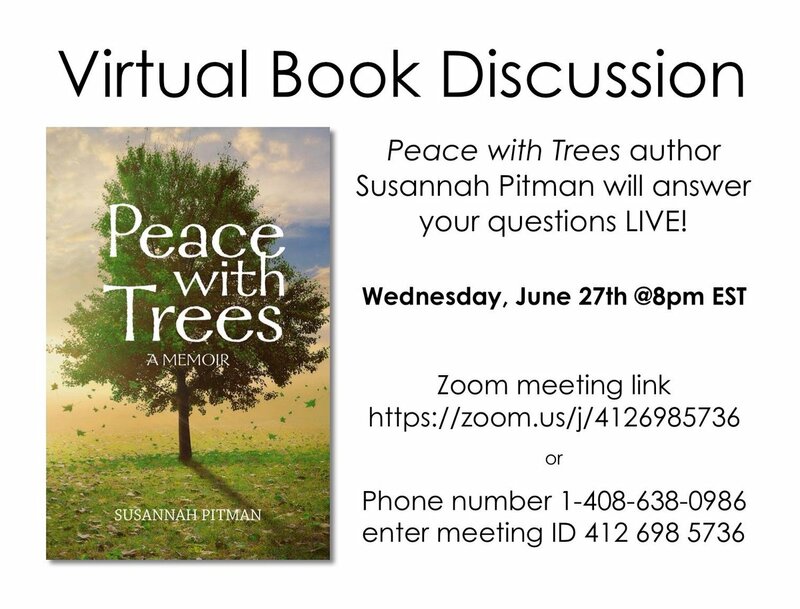 As a result of an accident (as depicted in Peace with Trees), Susannah has managed her life with post-traumatic stress disorder since 1997. Her articles have appeared in HuffPost and PTSDJournal. She is the administrator of Peace with PTSD, a Facebook group designed to provide inspiration, positivity and information on tools that help people with PTSD. She also regularly speaks about living a happy life with PTSD. She maintains her successful acupuncture practice in Boonton, New Jersey and has been voted “Favorite Acupuncturist” by Natural Awakenings New Jersey readers for 2012 and 2013 and “One of the Best” in holistic care by The Daily Record readers in 2016 and 2017. In conjunction with Acupuncturists Without Borders, Susannah organized and led acupuncture clinics for stress relief following Hurricane Irene and Superstorm Sandy. She and her husband live in Randolph, New Jersey and enjoy traveling to Mexico, California and Vermont. Q1. Tell me a little about your mental illness and if you have sort help? I developed PTSD in August of 1997 after I witnessed a tree fall onto my father during a fast moving thunderstorm. Back then, no one talked about PTSD like we do today, so I had to find my way out of the disorder. Fortunately, I discovered that yoga, massage therapy and acupuncture helped me feel better and regain some motivation to improve my life. In 2011 after I experienced one of the worst flashbacks I’ve ever had, I sought therapy. Since then, I have lived peacefully with PTSD. Q2. Have you taken antidepressants? If so what affect did they have on you? What advice would you give to someone starting a course of antidepressants? I never took antidepressants. I was given a Xanax shortly after my traumatic experience. It did nothing for me. Though I understand and support anyone who relies on medication to move through their symptoms, I prefer to use a holistic approach. Q3. What coping strategies do you use on a bad day? I no longer have bad days, but I used a number of things to move through bad moments. Yoga, deep breathing and writing help me in the immediate moment. I’ll use acupuncture, massage therapy and talk therapy when I feel I need to make an appointment. Q4. What effect do you think social media has had on your mental health? What affect do you think it has on other people’s mental health? I love social media. I recognize that lately I may be in the minority on this. I put effort into my various social media accounts so that I see posts that will inspire me or make me smile. I’m a big fan of blocking and deleting things that I do not like. The vast majority of the time, the feeds on all of my accounts are posts that lift me up, which in turn gives me positive energy that I can carry into my day. That being said, I can appreciate that social media can be hard for people. I think people can get caught up in comparing their lives to others, which in turn can make people feel bad about their lives. I also think seeing graphic or violent posts is harmful. I’m glad to see an increase in awareness for mental health. I do think more education is needed. I don’t allow myself to let a stigma impact me, but I understand that others are deeply affected by a stigma. How I help educate the public is by writing and speaking about my PTSD. In the US, the image about PTSD that’s painted is of a male veteran, suicidal and highly dangerous. I’m a female, non-veteran, never been suicidal and I’ve managed to create a life by my design. By sharing my story, my hope is to inspire others with PTSD that they too can move through their symptoms and find peace while educating others about PTSD. I may be experiencing a stigma now but I’m not allowing it to affect me. I’m also an acupuncturist. A number of my patients have read my book. A small few have not been back to see me recently. I’m unsure if their lives have gotten busy or if they’re now uncomfortable with me treating them knowing I have PTSD. My book is incredibly inspirational, so I’m leaning towards life being busy for this small group, but if they are uncomfortable seeing me, I’m okay with that. In my opinion, that’s more of a reflection of them rather than of me. Q7. Finally, yay! I hear you say. Time does not heal all wounds….effort does. Make an effort every day, even if it’s simply making your bed in the morning. Not every day has to be a big step forward. Consistently taking action to help yourself will iron out the wrinkles that’s imprinted into the fabric of your being. Do what gives you joy. Find a therapist you connect with. Reach out to groups of people who understand but also lift each other up. And take your time. You can life a that you want rather than one that’s dictated by the result of your trauma. Next Mummy Thomas’ Mental Heath Questionnaire With Jo.